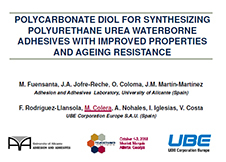 ETERNATHANE® by UBE is a series of polycarbonate-based and isocyanate-terminated urethane prepolymer with customizable polycarbonate and isocyanate composition, for polyurethane applications requesting high performance and maximized durability in harsh conditions overtime. This prepolymer series can be supplied in a wide range of free NCO content, allowing to meet your specifications and polyurethane properties. This series present a working pot life useful for both machine and hand-batching procedures. 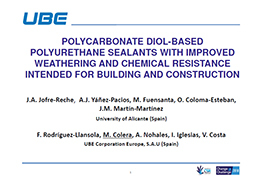 ETERNATHANE®-based polyurethanes properties can be adjusted by using a standard or a mixture of different curative agents, such as UBE ETERNACOLL® polycarbonate diol. 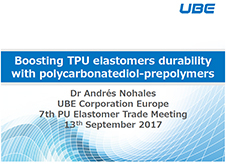 Polyurethanes based on ETERNATHANE® exhibit enhanced durability against extreme conditions and maintaining original performance overtime.